For me, vegetarianism has always been a choice that requires a great deal of caring, whatever level of it I am at. While accepted, because meat-free is still not the way the majority eats, to be a vegetarian in our society involves careful investigation and a bit of nitpicking. In a city like New York, it’s easy to dine mainly at vegetarian-friendly restaurants, seek out your preferred brands of tofu and veggie sausage, and ask a waiter at a non-veggie establishment to serve your roasted brussels sprouts without the bacon topping. When you’re committed to the eating habit, none of this is hard. But food for me is not just about what I put in my mouth. In my life, it has a social and traditional aspect to it that I think rivals the actual gastronomical aspect of any particular dish. This ranges from eating matzoh balls on Thanksgiving (a family tradition) to respecting the standard manners of a polite guest dining at a friend’s house. I came to feel like a giant pain in the neck requesting special meals (matzoh balls sans chicken fat or a dinner I’m not making that must be based around my needs)–though I recognize that not everyone has as low a guilt threshold as I. But since in the rest of my life, I take pride in being flexible, it started to seem strange that I had become a “picky eater.” This fall, I began to reduce my special requests. At restaurants, I wouldn’t ask if my meal had been made with chicken stock. When invited to friends’ houses, I wouldn’t ask about the menu in advance or even alert them of my vegetarianism. I’d just go with the flow, and if the dish was one that didn’t appeal to me, I’d take a small portion. This felt something like maturity. Of course you carnivores will be happy to know that once I decided I’d eat a little meat (like a particularly appealing bite of Alex’s pork chop at dinner one night), I remembered how mouth-watering it is. That’s when I realized that, contrary to what I’d thought for a while, it wouldn’t just be about flexibility while out of the house, but about starting to cook a little meat for myself at home. And that’s also when I noticed I was craving beef stew, and I’d have to develop a beginner’s plan for making it. 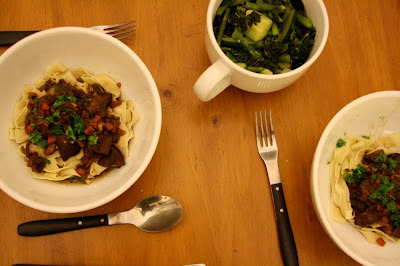 I wound up using my slow cooker, and I balanced out the richness of the hearty stew with a bowl of homemade noodles and a side of steamed kale, zucchini, and asparagus. Admittedly, it was strange to have my apartment smell like browning beef, but I wasn’t displeased with the scent. If I had to give it a name, I guess I’d say I’m eating in a Mark Bittman style. That means small portions, a couple times a week, of meat from quality sources that has been raised in a humane fashion. As I am conscious about the origins of my eggs, cheese, beans, and broccoli, so too I try to be aware of where my chicken, beef, or bacon comes from. I also think it’s an interesting exercise to have meat on the table without making it the main event, to add small bits to otherwise veggie fare, or to have side-by-side main dishes, one with meat and one without. This is a practice I’ve used in the past, only then it was meant as a way of feeding both vegetarians and non. Now it’s a way of incorporating meat but not focusing on it. For those vegetarian readers, I want to emphasize that I still largely cook vegetarian and often even vegan–it’s the food I’ve always liked best. In fact, I just made a spicy pot of chickpeas and potatoes in masala sauce that I can’t wait to eat (and will post about this week). I will always rather have a veggie burger than a burger of ground beef. Subsisting on vegetarian fare is more budget-friendly and often more healthful. But at this point in time, for me at least, it doesn’t have to be my singular way of eating; I’m happy, right now, to be a contradiction. You can also make this in a Dutch oven on top of the stove, I just didn’t have one yet when I made this. If you do so, stew the beef for about 2 hours, covered, at a low simmer. Check it as you cook to make sure it hasn’t dried out; if it has, add more water. The stew tastes the best made one day in advance, chilled, and reheated. Salt and pepper the beef. Heat the oils over medium-high heat and sear the beef, in batches, in a large cast iron pan. Make sure the beef is brown on each side before flipping. When a batch is done, remove to a plate. When all the beef is finished, lower the heat and add the onions. Cook, stirring constantly, especially at the beginning while the pan is still very hot. Add the carrots and celery and sauté another few minutes until the veggies are quite soft. Put in close to a teaspoon of dried thyme, pinched between your fingers and crumbled, as well as the garlic and a good sprinkling of salt. After a minute or two, raise the heat and add the wine. Let it cook off until it reaches the consistency of thick syrup, using a heatproof spatula to scrape all the bits off the bottom of the pan. Add the veggies to the slow cooker with the beef and the water, and the bouillon cube if using. Add any extra water to cover the meat, then cover the cooker and let it stew on low for 7 hours. If you have time, cool the stew, then refrigerate it until ready to eat. Reheat in a pot on the stove. Serve with egg noodles, mashed potatoes, or crusty bread. I love all the extra vegetables that you add to your beef stew, and that it's cooked in a slow cooker! Can't wait for more recipes for veggies with a bit of meat. Cara, this is a lovely post and I wish you much health & happiness in 2010. Our home is mostly vegetarian with twice weekly small amounts of meat. It's such a healthy way to go, especially with care and attention to sourcing and seasonality. I look forward to trying your stew recipe – the balance of meat to veggies is just right. This was a very interesting and thought provoking post! Dan and I have been trying to cut back on our red meat consumption (I with much more success than him). Beef stew in a slow cooker with lots of extra veggies just sounds delicious! Once, when my vegetarian college roommate was stressed out, we caught her eating a salami sandwich. Sometimes you just have to eat what you want. best post EVER. you are a picture of maturity! I'm proud of you, Cara! I am trying to go the opposite way – turning meat from the main event into what you have been doing, using it as a side, or as a flavoring to vegetables. I wish you luck! cara, this is a big step! what a beautifully articulated post, and what a perfect dish to welcome in the new omnivorous year. big hugs to you and phoebe! I love beef stew served with good crusty bread on a cold winter's day (like Superbowl Sunday, for example- a tradition in my family). I have been using a recipe in which you don't brown the beef before sauteing the vegetables, but your way sounds much better. I'll have to try it. Thanks! so i just made this and it turned out AWFUL! i chose not to add the bouillon which was probably mistake. all i taste is wine and thyme. and it's so watery. bummer. I made this stew yesterday in the crock pot. It was really good. The only thing I did was thicken it on the stovetop with a little conrnstarch. I thought it was a little thin, as did one of the other posters. That made a nice thick sauce for over the noodles. I will definitely be making this one again!!! Great on a cold winter's night!! How successful is this recipe when it is multiplied for more servings? So if you were going to serve 6 -8 would you multiply straight across? Yes! You’ll just have to brown the beef in a few more batches. Hi Cara! Instead of water, could I use beef broth, or would that make the stew too salty? What is the difference in flavor that you get when using water as opposed to beef broth? Thanks so much! I’m looking forward to making this tonight for me and my boyfriend! 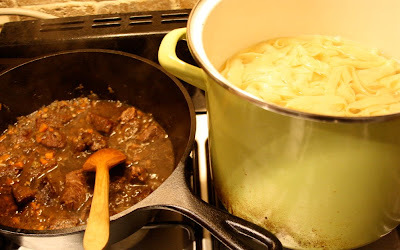 Amanda–yes, you can use beef broth. I think the stew has plenty of flavor with just water (and I’m not a HUGE fan of boxed broth anyway). If you do use it, just buy low-sodium and be careful with the amount of salt you add. Hi Cara! I’m in the process of browning the beef right now and I was wondering after I am done browning it and it is resting on a plate, at what point do I toss it back in the pot? Thanks!